Beware of smart phone and automated map directions as they may not direct you to Clark Gardens correctly. You are welcome to call the Clark Gardens business office for directions at 940-682-4856. 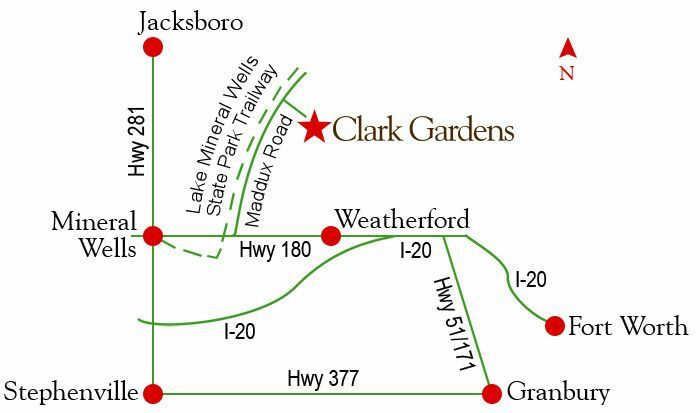 Clark Gardens is 3 miles east of Mineral Wells, Texas and 1 mile north of Highway 180. From Highway 180, turn north on Maddux Road and go approximately 1 mile. The entrance to Clark Gardens will be on the right/east side of the road. Clark Gardens is approximately 45 minutes from Fort Worth, Granbury, Stephenville and Jacksboro; and 15 minutes from Weatherford.